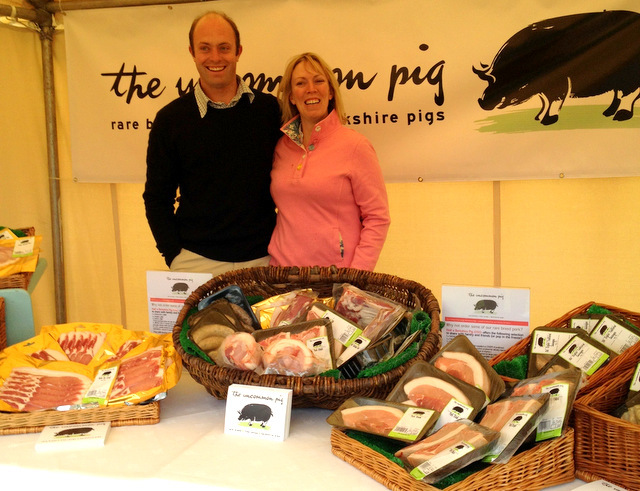 We were so honoured to be asked to take part in a Dorset Food Fair in the grounds of Sherborne Abbey on May 1st 2012. The Food Fair took place on the day of Her Majesty The Queen’s visit to Sherborne as part of her Jubilee Tour. There were only 10 Dorset producers selected to take part – Olives Et Al, Dorset Cereals, Fudges, Denhay Farms, Sherborne Castle Wines, Hall & Woodhouse, Clipper Tea, Dorset Blue Vinny and Us – The Uncommon Pig. This was our stand at The Food Fair. Feeling rather nervous waiting for Her Majesty to arrive and meet all the Dorset producers. Here we are being introduced to The Queen. It was such a proud moment. We told The Queen all about our farming story. She thought it was fantastic and said she was looking forward to tasting the pork in her hamper! We were also filmed on the farm at home and on the day for BBC programme – The Queen and I. This link below will take you to the BBC iplayer – watch from 25 mins to see us and our farm!